Jean Dubuffet pochoir "Prarie de Barbe"
Medium: pochoir (after the drawing). Printed by Daniel Jacomet in 1960 for XXe Siecle (issue number 14 "Nouvelle situations de l'art contemporain"), published in Paris by San Lazzaro. Size: 12 3/8 x 9 1/2 inches (315 x 240 mm). Not signed. Medium: lithograph. 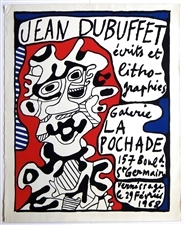 Printed in France on brown tinted paper and published in New York by the Pierre Matisse Gallery for a now quite scarce exhibition catalogue, on the occasion of a 1950 exhibition of Jean Dubuffet paintings. The sheet measures 7 3/4 x 7 3/4 inches (197 x 198mm). 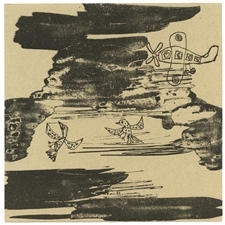 There is another lithograph on back, as issued. Not signed.